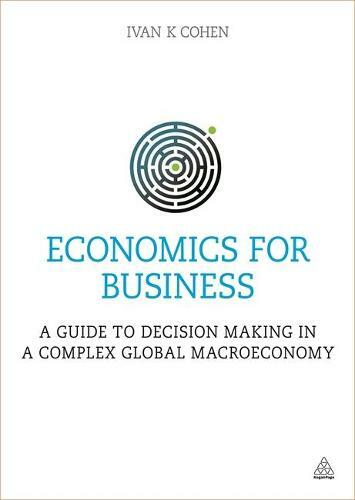 Economics for Business enables the reader to develop a clear understanding of the economic environment in which business takes place. This comprehensive book covers: the process of globalization and its implications for business; the role of the market and supply and demand; the impact of demand on branding and brand loyalty; and pricing strategies under various market structures. With specific business content integrated throughout and a global perspective on the current world of business, taking into account the financial crisis and its aftermath, Economics for Business is a useful introduction to economics for business students, a streamlined and comprehensive alternative to large undergraduate economics textbooks, and a valuable resource for managers and executives who need to understand the basics of economic concepts to grow their business. Online supporting resources for this book include bonus chapters on shareholders, trading blocs and skills groupings, a glossary, history of economics and an instructor's manual. "An absolute 'must-read' for anyone having to do business on an international level in the current global economy, and of critical importance for anyone whose business is affected by global business climates, "Economics for Business: A Guide to Decision Making in a Complex Global Macroeconomy" is exceptionally well-written, organized and presented, making it ideal for students, business executives, and non-specialist general readers with an interest in the global economy. ... [S]trongly recommended for corporate, community, and academic library Business & Economics reference collections and supplemental studies lists." --Logan's Bookshelf, Reviewer's Bookwatch "Midwest Book Review "